Read Part 1 of this review to see a blood and guts technical dork-fest about the SHIFT. In this part 2 we'll offer our impressions about the SHIFT. I say "we" because this review shares three perspectives. While I am light and focus on meadow-skipping powder touring, Toby is bigger, meaner and splits his time between inbounds and charging. Tom is also bigger and a park and inbounds skier who occasionally tours. Some people will approach this from the perspective of powder-snob dorks who are used to Dyna-fiddling. Some will be the HULK- SMASH camp. Some will want to know how SHIFT works when landing switch. I could pop out on the first click if making aggressive kick turns or kicking in skintracks on icy slopes. This will prove useful should you ever have the misfortune of getting caught in a slide on the way up as the toe in first click position should release. - The multiple moving parts on SHIFT beg for ice build up but that was never a significant concern. I speculate that one reason for that is that there aren't many metal on metal contact points. There also seems to be an absence of crevices for snow to pack up and then form into ice. For whatever reason, even spring schmoo tours didn't result in icy build up frustration. - SHIFT brakes are wide. I found that the 100mm brakes on the Salomon QST 99 SHIFT easily fit the Atomic Backland 107 without bending. Size your brakes accordingly. The width of the brakes meant that it was relatively easy for brakes to hit in tour mode. Annoyingly this would result in the brakes deploying meaning that intermittently you'll have to reach down to flip the switch from ski to walk mode at heelpiece. - I found that the gap of the pins when the open lever of the toe is fully engaged is narrower than "standard" tech fittings. This meant that I have to insert the pins from one side then step in as opposed to simply stepping in as I would previously. It's not a big problem in firm snow but in deep pow it does add unnecessary fiddle factor. In Toby's words - I am a former ski racer who shreds 100 day + seasons and demand gear that holds up to aggressive border line abusive usage. Did I mention I weigh in at 200lbs!? I spent 3 days at Blackcomb testing this gear and feel confident that it will hold up under all conditions. Did a few laps on cut up snow in Spankys and ran it into a few traverses. The bindings felt solid. I was so stoked on them, I decided to get into some rowdy terrain and see how that went. A couple 10-15 ft cornice drops onto steep variable conditions and I was sold. They held me in and the Backland skis also surprised me with how supportive they were even if they were a bit short for my size. . No joke. I landed a 10 footer in the back seat, expecting to blow an ACL. No pre-releases and it felt just like my alpine binders. I stood right up and skied out of it no problem. To me, it does it all. Rip fast resort groomers, bang around in ice bumps and then let em run when it dumps. After you track it out inbounds, head out of bounds and destroy the slackcountry before anyone else can get up because this gear is stupid light. No more compromising gear. 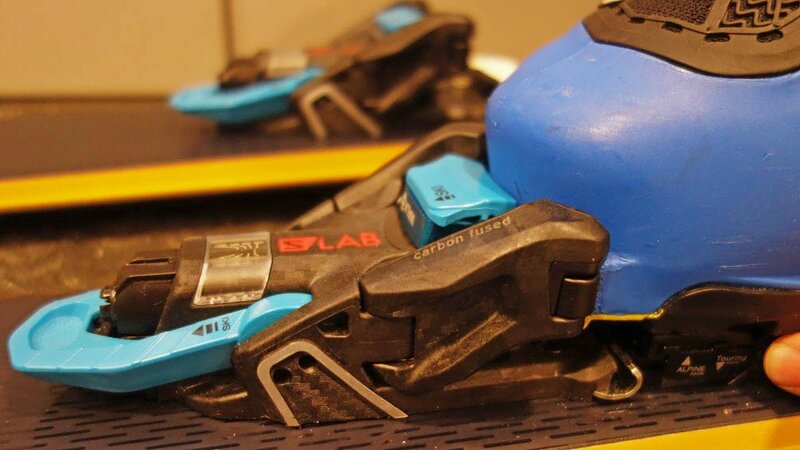 No more worrying about clapping out tech bindings at the resort or locking them out out ski touring over exposure. Thank you Atomic & Salomon for keeping it real in the next progression! I am 175lbs. I've Skied for 28 years and skied park for 16. l learned on the plastic hills of the UK but got out into the backcountry of Whistler when I moved here and have since moved on from the grass and plastic! The Shift binding is something I have been keeping an eye on for a while now. In my opinion tech bindings can't be beaten for touring but I have found through use that they simply can't stand up to the kind of use a lot of park skiers will put them through. For example when I was testing the Atomic Backland touring boot a few years back I broke a very respected tech binding in no time at all doing some very light (or at least what I would consider light) riding. There's the Dynafit Beast option but that had its own issues. But this is academic since Beast has since disappeared, which left the Marker Kingpin for those of us who wanted tech but also wanted to shred. While the Kingpin is good it's certainly not perfect. Fundamentally you still have to use the tech toe on the down and although its' relatively solid, I've had some big falls due to the toe pre-releasing. I've also seen quite a few pins sheer as they just can't take the kind of park-riding a lot of people might want to do. Enter the Shift. Pins for up and a normal toe for the way down. Sounds like a perfect, solution but could it be done? I didn't tour on them; leaving that to Lee. Instead I pushed them hard inbounds, using alpine boots. When I test a new binding I often like to use a slightly lower DIN then I normally us. This allows me to identify if and how a binding may pre-release before I start riding hard on them. I normally ride at 12 but set the SHIFT to 10 to see how it would fare. Well with the SHIFT I actually could ride it at 10 without violent pre-releases (I would still up it to give an even more solid hold but I did not have any issues I have found on other "alpine bindings" at 10). I found I could carve as hard as I wanted, ski the worst beaten up pow and even spent a full day in the park with basically no issues. At one point going fast and carving hard I did feel the toe of one ski begin to give but before it went the boot snapped back in fine and I skied it out with no problems. If I rode them at my normal 12 I honestly believe I would have no issues at all. In the park they rode basically as well as any other binding. SHIFT did not have the lack of damping that a Kingpin can have and basically they felt like any other alpine binding. In the park and inbounds at my weight and size, the SHIFT is enough for me and I would happily use them on any ski that I would potentially want to tour on, or basically anything but a dedicated park ski (where I'd keep my PX18s). Bottom line is that SHIFT destroys my old Kingpins in terms of damping and overall feel. The fact you can ski them in any boot (although you still need tech toes to tour them) is huge for me as it gives me choices so I can pop out for a quick touring lap after getting some inbounds and park laps. I'll still stick to my dedicated alpine boots and alpine bindings when I know I'm just running around inbounds but on days where no decisions have been made I'll have options. By mounting SHIFTs on my touring skis they truly become my "everyday" skis. My final takeaway is this. If you don't need to ski above a din of 13 SHIFT will be perfect for you and offer so much more then any other touring binding currently does. - Firstly, and honestly it's not really an issue, but I did not like the toe height. I ride Look Pivot 18's on all my skis which have a ramp of approximately -5mm from heel to toe (Ie the toe is 5mm lower then the heel). The SHIFT has a flat ramp angle and initially felt very toe high. This did throw me off to start but after a few runs I got used to it (told you it wasn't really a big issue). If you test the SHIFT give it aday to get used to the feel and try not to judge them after one run. - My other issue was the AFD itself. SHIFT uses a pivoting AFD rather then a height adjustable AFD. It works in that it will accept anything from a full tour sole to an alpine sole but if, like me, you use an alpine sole you end up with the AFD tilted/ramped a lot to have it contact the boot. This means you only have a tiny part of the AFD in contact with the boot. While it works in that it did not actually cause any issues I just did not think it was ideal. I also wonder if the way the AFD pivots will be a potential durability issue. - Finally I did not like the way you change the toe from touring to ski mode. I pretty much only use mittens and it was not easy to convert the toe. While it was doable it certainly wasn't convenient. About the Salomon QST 99. The dimensions paint this more as a all-around ski suited to hardpack then to powder. And the dimensions don't lie. Edge-hold is remarkable; swing-weight is minimal so you can pull it around even in tight situations. In light powder the QST99 does fine but gets bogged down if you get into the mank (think 30cms+ of wet coastal concrete) where you have to work harder to plane. About the Atomic Backland 107 (replaces old 109). Dimensions suggested that it would be turny but undergunned in deeper pow for skier of Toby and my weight. But the numbers lied. Maybe it's the magic HRZN tech; maybe its the pronounced tip rocker. Whatever it was the Backland had no problem going straight and it certainly had no problem skipping over and driving through powder, or chopped up snow. In fact Backland was alarmingly happy going sideways at high speed in sluffy pow. The only part where the Backland was lacking was in hardpack and chopped up snow where it felt vague. But that certainly was not something one would expect of a softer, wider ski so that's an issue you expect with a specialist pow ski.